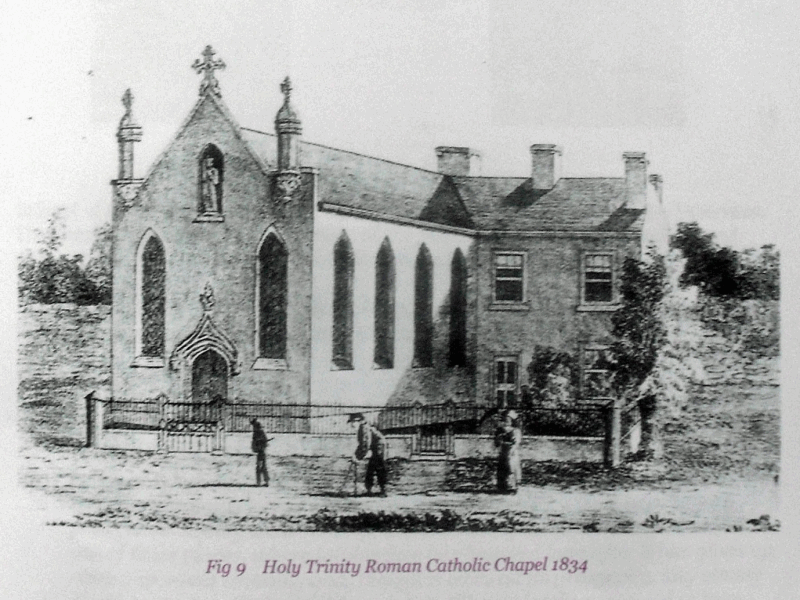 The first Roman Catholic Church in Sutton was opened on October 21 1834 in Lichfield Road near Bishop Vesey’s Grammar School - the building, known as the Guildhall, is now offices. The opening was the subject of an article in the December 1834 issue of the Catholic Magazine, in which the writer commented that Sutton had been a stronghold of anti-catholicism - “But a few years back, a priest could hardly show himself without being insulted, Sutton Coldfield is one of those places where intolerance has lingered long after it has given up more important stations”. The Rev. Joseph Mendham was the author of a number of books critical of the Papacy, and preached a fiery sermon from the pulpit of Sutton Parish Church on Sunday 27 February 1820 on the occasion of the death of King George III. This sermon was published as a pamphlet, the first six pages being devoted to the king’s reign, but then Mendham turns to the qualities of George III as a defender of the protestant religion. The remaining seven pages are a diatribe against Catholics and against any relaxation of the restrictions under which Catholics suffered: “We owe it…to the true fortitude of our late Sovereign that the subjects and zealots of a foreign, a corrupt, an arrogant, and a sanguinary church, have not become part of the legislation of a protestant country”. In 1824 Sutton High Street extended as far as the Tamworth Road junction, and Mendham’s house, later known as “The Firs”, was the last house in the street. Next door was the Grammar School which at the time had only one or two pupils, where the schoolmaster Mr. Barker lived as a country gentleman, treating the grammar school as his private residence. Then came the Old Swan Public house, and beyond that a Baptist meeting house. Times were changing, the Catholic Relief Acts of 1778 and 1791 lifted most of the penalties to which Catholics had been subject, mass was being celebrated in a private house in Sutton in the 1820s, and the Catholic Emancipation Act of 1829 gave Catholics the right to vote. Mendham must have been shocked in 1834 to see the Baptist Chapel just down the road from his house being converted into a Roman Catholic church - he duly wrote an “Address to the Inhabitants of Sutton Coldfield on the Introduction of Popery into that Parish”. Mendham retired as curate and concentrated on his studies. He was “possessed of a rare attainment in scholarship” and continued to publish books and articles until his death in 1856. He formed a very fine library now housed at Canterbury Cathedral Library and the University of Kent - 106 of the most valuable books were sold at Sotheby’s in 2013 for £1,180,875. Illustration from the Catholic Magazine, December 1834.